ABCANTRA Kennels are insured, licensed, and inspected by the St. Tammany Dept. of Animal Services. We have two veterinary clinics acquainted with our operation and a 24 hour emergency facility available. The ABCANTRA facility is designed for ease of maintenance and the hygiene of its occupants. Our outdoor runs measure 4 feet by 10 feet and 6 feet in height. 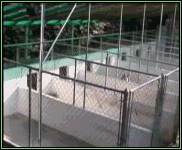 Each run has its own housing facility erected on the outside of the run, allowing the dog to have full access to the run, or house. The kennel flooring is swept concrete which allows the dog the ability to move about without slipping. Runs are partially covered allowing the dog to choose sunshine or shade. Kennels are cleaned twice daily. During cleaning, each dog is allowed out of its run and has full access to a grassy area for exercise. The entire area is fenced for added protection. All dogs have human contact and are allowed out of their runs twice daily for exercise. We also provide chew toys to occupy the tenants during their stay. ABCANTRA provides a high protein dog food which is fed to each dog being housed. A feeding schedule for each dog is determined by their age and activity. ABCANTRA Kennels are insured, licensed, and inspected by the St. Tammany Department of Animal Services, annually. Our permits are on display for all to see. Although we are very knowledgeable on health issues, we have two veterinary clinics, housing 5 veterinarians that are fully acquainted with our operation. There is a 24 hour emergency facility available, if needed. Prior to entering the facility, a copy of the dog's health record must be presented. All vaccines, including Bordetella (kennel cough) must be current. Each dog must be wearing its own nylon or leather collar. For the purpose of safety, it is preferred that the dog not wear a chain type collar while being housed at our facility. Boarding should be scheduled a minimum of 2 weeks in advance. A veterinary shot record of all required vaccinations and Bordetella (kennel cough) must be presented prior to entering the kennel. Payment for Boarding is due at the time of Pick-up. We are open for drop-off or pick-up between 8am and 6pm Monday - Saturday. We are closed for pick-up and drop-off on Tuesday, Sunday, and Holidays. For more information on boarding, please utilize our Contact Form or call 985 892 6773 between the hours of 8am and 9pm CST. If we miss your call, leave us a message and we will respond within 24 hours. $20.00 per night, per dog, regardless of size. Open Monday - Saturday, 8:00 a.m. to 6:00 p.m. Arrangements for boarding must be made in advance.